A nurse has confronted NHS England board members about their ability to deliver the NHS Long Term Plan without the necessary staff. The plan, published last month, set out the government’s ten-year blueprint for the NHS in England, and states that a workforce strategy will be published in the autumn. But critics of the plan, including the RCN, say its aims for healthcare are undeliverable as long as the NHS staffing crisis continues. Of the current 108,000 NHS vacancies in England, more than 40,000 are nursing posts. London palliative care nurse Gay Lee had been sitting in the public gallery during an NHS England board meeting on 31 January. As the session was coming to an end, she interrupted the speakers to express her views. She did not state her name. She said: ‘I have been a nurse for 40 years on the front line, I am 70 years old and I am still working part-time. Ms Lee, who is semi-retired, said the board had ‘only talked about the good aspects’ of the 10-year plan and had been ‘very self-congratulatory’. ‘One thing I do want to say, which I have not heard in this meeting, is any real concern about the workforce that is going to do all this wonderful work. ‘We haven’t got enough staff now, we haven’t had enough budget since 2010 to train staff, we haven’t got any workforce strategy. She encouraged other nurses to speak up where possible. ‘I know it's easy for me to stick my head above the parapet because my nursing career is almost at an end. But things are in such a bad state now that I am sure most managers would be pleased for nurses to tell it like it is when they have to stay silent,’ Ms Lee told Nursing Standard. 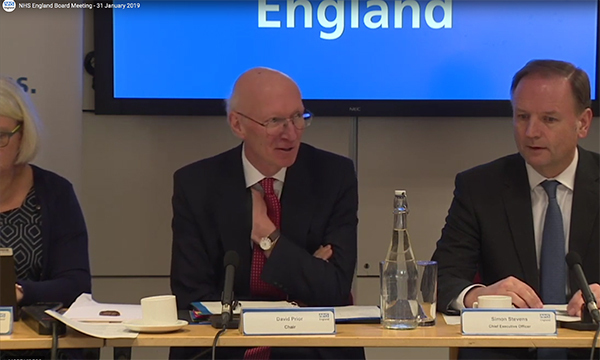 NHS England chair David Prior responded at the meeting by saying the workforce was ‘fundamentally important’ and was crucial to delivering the long-term plan, but did not offer any further comment on the issues raised by the nurse.